Fields of wheat and barley may not be easily seen in Thailand. 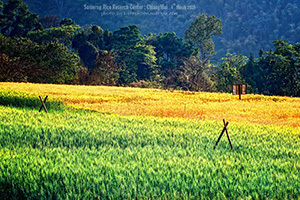 However, the Chiangmai district popular with travelers wheat fields shared by the Internet regularly. Fields of barley that is in charge of the Rice Research Center Chiang. Research and Development Department, Rice, Rice, tourists can visit to visit. Wheat here is part of the rice research. There is a one year only a few months. It is during the months of February - March in mid March wheat become golden. Full of golden meadows interspersed with other colors. Is very beautiful Because rice is quite vast. Tourists often take into played regularly trading port . This is the hallmark of a wheat field. When the wind blows Rice fields are leaning swaying alternately viewed as the right eye. The one who came to the evening, they will have the opportunity to take the golden rice to the sun. There is also a field of barley in rice research center as well, only with a much smaller area. Chiang Rice Research Inception in 2521, according to the whim of His Majesty. Link to the benefit of the people of Thailand and the Thailand hill tribes living on the high agricultural occupations. Forest Department has raised the reserve to establish an experimental station. Department of Agriculture, Kasetsart University and has conducted research in the field of rice. Breeding upland rice and cereal crops. Later in the year 2549 when Rice became " Rice Research Center Chiang". Rice Research Center Chiang research and development of rice. Production technology custody harvest. And processing of rice / wheat. Seed production of rice / wheat. The main varieties were screened and Inspection and certification system for rice / wheat and fit. They provide academic rice / wheat. With a total area of approximately 308 acres with an average height above sea level of about 735-830 meters.